When a wealthy client goes missing in time, Timeshare Unlimited calls upon John Surrey, ex-LAPD and currently head of security for the time travel agency to rescue the client. John together with his wife Althea travel from 2007 to 1920's America where they embark on a cross-country mission to track down their target and return him to the present. In Joshua Dann's second instalment in the Timeshare series he continues to flesh out the central characters he introduced readers to in his first novel, Timeshare, while entertaining the reader with a jaunt across 1926 America. During John Surrey's cross-country search for the elusive Hollywood producer and Timeshare client Mitch Levitan, the author manages to include scenes with no less than nine celebrities (and in some cases yet-to-be celebrities). Names including Charles Lindbergh, Ronald Reagan, Al Capone, Bugs Moran, Bugsy Siegel, Cab Calloway, Edgar Hoover, Dorothy Parker and the Algonquin Round Table and Japanese Commander Yamamoto. With the exception of Dorothy Parker, few if any of the historical figures are central to the plot and at times it feels as if Dann has constructed scenes specifically to name-drop and is using Mitch Levitan as a plot device to string together the celebrity cameos. All criticisms aside, I felt that Dann's writing shone it's brightest when he was dealing with his central characters and their connections to the past. Whether it was Mitch Levitan visiting his Uncle Harry Levitan as a young struggling writer or Terry Rapport visiting his grandparents as honest store-owners trying to get by. The celebrity name-dropping during the rest of the novel threatens to overwhelm the poignancy that Dann develops through these central characters during these few brief scenes. Dann does manage to find time in his action packed book to touch on a couple of Time Travel related topics. Firstly, Dann discusses one of the troubling side-effects of time travel that I always wondered about. If a time traveller were able to alter the past and return to the present, the only one that would be aware of the change would be the traveller since only they retain the memories of before and after, but if you changed your own past the you memories would alter to coincide with the new reality. John Surrey's comrade Terry Rapport explains the memory effect and that only an independent observer unaffected by the changes can distinguish the divergent timelines. "When you change your own history, you don't necessarily change the world, just your own world…somebody who world hasn't changed isn't going to notice the difference. Sometimes, you don't see it yourself. The person who knows the difference between the two, in my layman's term, is the hinge, the hinge between the two…fates, if you will"
An interesting concept that John Surrey graciously names the Rapport Hinge in honour of his friend. Dann also boldly tackles the age-old time travel cliché of using time travel to attempt to kill Hitler prior to World War II with interesting results that also serves to demonstrate the Rapport Hinge to spectacular effect in a brief but meaningful passage towards the conclusion of the book. 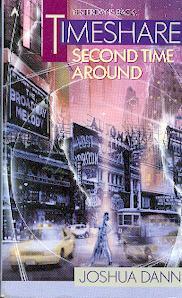 Timeshare - Second Time Around is an enjoyable read that many will appreciate. Andy Anachronisms' review of the first novel in Dann's Timeshare series.